Update #2: I originally posted this story late Wednesday night and have revised it early Thursday morning based on additional information I received via email from P.E.I. Brewing Company. Updates to the post are made in italics and include a different pic. There have been rumblings on Twitter that major news was coming from Gahan Brewery in Charlottetown P.E.I. One of my informants (thanks PEI Beer Guy) sent along a link highlighting several pieces of news. 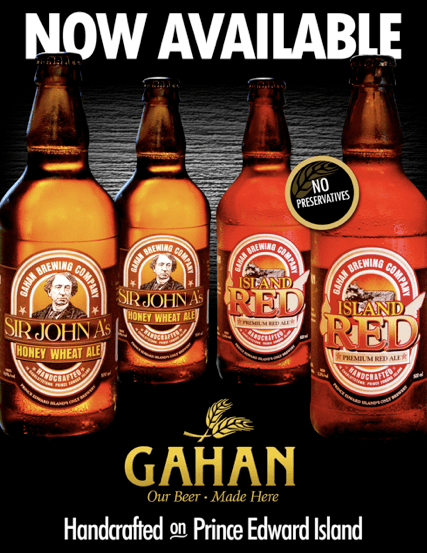 Gahan Beer is in the process of shipping its beer over to New Brunswick for the first time. The article does not confirm which beers are available but another informant tweeted me (thanks @MeekBrewingCo) indicating that he noticed empty spots for both Honey Wheat and Island Red (one of my personal favourites, although admittedly it is a long list) on a NB Liquor store shelf. I have since received confirmation from the P.E.I Brewing Company that these are in fact the two listings that are available in New Brunswick. It also appears that the company will be re-branded as the P.E.I. Brewing Company (the company had previously been known as Murphy’s Brewing Co.). The company plans to sell a new kind of beer, which wasn’t named in the article, on the Island and across Canada under the P.E.I. Brewing Company label. In related news, the new beer is expected to be canned. The P.E. I. Brewing Company has confirmed that a new brew which is not currently currently in production (I have no confirmation as to which type of beer) will be canned and distributed by the P.E.I. Brewing Company. To my knowledge, this would be the first canned offering from an Atlantic Craft brewery (Pump House does own some equipment but has yet to distribute its beer in cans). For the most up-to-date information check out their Facebook page. ← More Private Sector Involvement Expected in Liquor Distribution in N.B.